This life-size sculpture of a Newfoundland dog was commissioned by John William Ward, 1st Earl of Dudley, to commemorate his favourite dog. It was to be placed in Lord Dudley's house in Park Lane, London. The dog was sent from Lord Dudley's country seat, Himley Hall, Staffordshire, to London to sit to Wyatt 50 times. Lord Dudley died in 1833, before the sculpture was finished, and a dispute about the price (£5,000) between Wyatt and Lord Dudley's executors was never resolved, the sculpture remaining in Wyatt's possession until his death in 1862. Matthew Cotes Wyatt (1777-1862) was the son of James Wyatt the architect, and was a painter and designer as well as a sculptor. 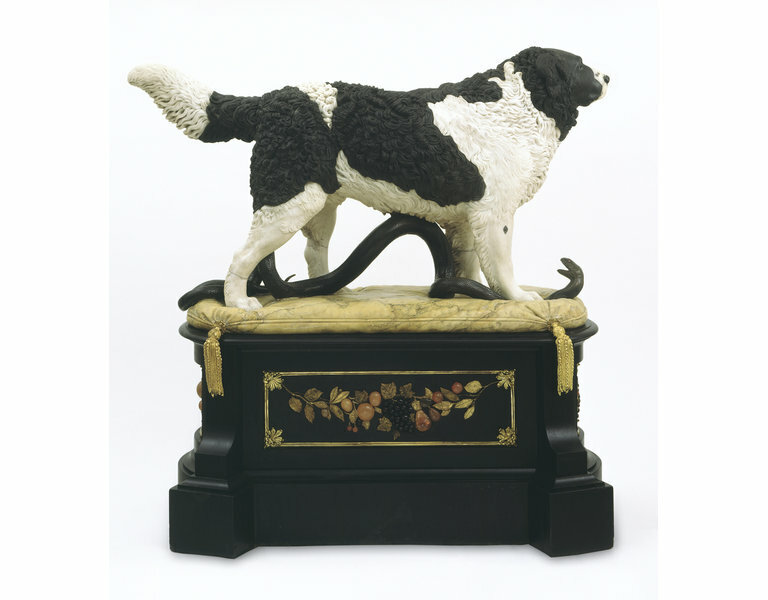 The elaborate base made for Bashaw reflects his abilities in the field of decorative arts. In 1834 Wyatt held an exhibition of his works, the centrepiece being Bashaw, which was described in the catalogue as 'the most elaborate [portrayal] of a quadruped ever produced by ancient or modern art'. Wyatt's most controversial work was his last, a gigantic bronze equestrian statue of the Arthur Wellesley, 1st Duke of Wellington, for the new arch at Hyde Park Corner; on its erection in 1846, it provoked a storm of controversy, and it was eventually removed from the arch and taken to Hampshire, where it remains today. Wyatt exhibited Bashaw at the Great Exhibition (1851) under the title 'The faithful Friend of Man Trampling under Foot his most Insidious Enemy'. It remained unsold at the sale of Wyatt's effects after his death in 1862, and fell into the possession of his son, James, who put it up for sale at Christie's in 1887. It was unsold, but subsequently passed into the possession of John Corbett of Impney Hall, Droitwich, Worcestershire, and was then sold to Edward Stevens of Prescott House, Stourbridge, Worcestershire, in 1906. In 1957 the sculpture was sold to W. Malkin of 'Bygones', Birmingham. By 1960 the piece was owned by Messrs Sneed & Knibbs, monumental masons, who sold it to the V&A for £200. 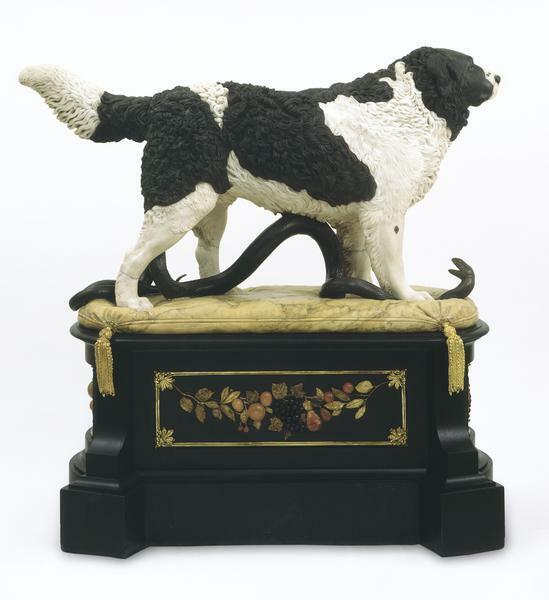 This portrait of a Newfoundland dog, which is executed in black, white and grey marble, with eyes of topaz, sardonyx and black larva, stands on a yellow marble cushion adorned at the corners with ormolu tassels. With his right paw, he tramples a bronze snake with ruby eyes. The cushion rests on a black marble base, embellished with swags of foliage, fruit and flowers. These were made of plastic in the Conservation Department to imitate the original hardstone carvings which went missing shortly before the statue was acquired by the museum. 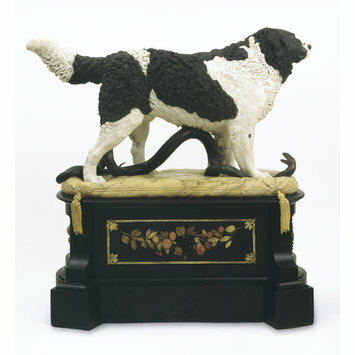 John William Ward, Earl of Dudley, a wealthy bachelor aristocrat, recently retired from politics, commissioned the statue of Bashaw, his Newfoundland dog, from Matthew Cotes Wyatt in 1831. He intended that the statue would stand in his Park Lane town house. Bashaw was sent to London to sit for the sculptor and in May 1832 Dudley approved Wyatt's second model in which Bashaw was represented in a standing, rather than seated, pose. Wyatt then went to work on the marble, which was completed two years later. However, Dudley died in 1833 before the work was completed and his executors were unwilling to pay the sculptor's five thousand guinea fee. After many years of fruitless correspondence Wyatt himself died in 1862, still unpaid. In his will the sculptor decreed that Bashaw's statue could be sold to any art loving aristocrat for any price, or presented to a museum but that any member of the patron's family would have to pay the full fee of five thousand guineas for it. The statue changed hands five times before it was eventually bought by the Victoria and Albert museum in 1960. Bryant, Julius. Bashaw by Matthew Cotes Wyatt, London: HMSO, 1983. A Victoria and Albert Museum publication.